All around the world schools are results-based institutions. Schools and students are assessed by tests and examinations throughout the year, and we are proud to consistently achieve some of the best results throughout the country. Young people in Sierra Leone face very difficult challenges. It is in our remit, and our constitution, to provide education to the most vulnerable people in this country. 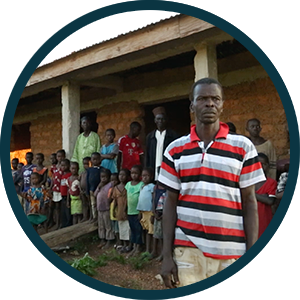 Sierra Leone has many vulnerable individuals: more than a decade of the rebel war between 1991 and 2002 left 50,000 people dead and 2.5 million people displaced. 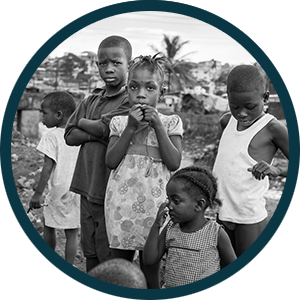 17,000 children were orphaned, and without any semblance of a domestic welfare programme, many of these were left to fend for themselves. 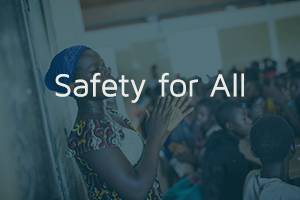 The 2014/2015 Ebola outbreak – the most deadly that the world has ever seen – created a huge sense of paranoia and distrust amongst communities, with survivors being shunned from their family and community groups. Throughout both of these periods of turbulence EducAid has been there to do what we could: after both of these crises EducAid immediately sought out these orphans, and brought them in to our protective care where they were given the environment and education to flourish. We have always tried to help the most vulnerable, be it orphans or oppressed and under-represented groups. This is not simply a noble or charitable exercise; we see huge potential in these resilient youngsters. 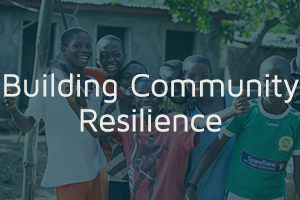 Our objective of ‘Pursuing Excellence’ does not sit at odds with the policy of providing education to ‘the most vulnerable’, in fact the resilience and independence can often provide a bedrock with which to excel. With the right support, anyone can achieve excellence, as we learn on a daily basis. 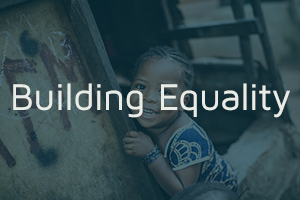 EducAid routinely achieves the highest grades in this country, all the while working with some of the most disadvantaged young people in Sierra Leone. We can do this because our education comes at no cost, but this does not mean that our students pay no fees. The EducAid fees are: Excellent Attendance, Excellent Effort, and Excellent Behaviour. Nobody can pay these fees other than the students themselves. Whilst Leo’s story highlights the difficulties that young people faced in the rebel war, it also demonstrates the importance of not giving up. 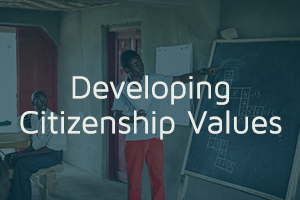 Education has the potential to transform an individual, and we firmly believe that if these individuals are instilled with the right citizenship values and leadership thinking, they are able to improve this country. 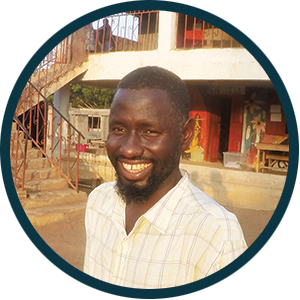 Leo’s story is not unique: EducAid routinely achieves the highest grades in this country, all the while working with some of the most disadvantaged young people in Sierra Leone. We can do this because our education comes at no cost, but this does not mean that our students pay no fees. 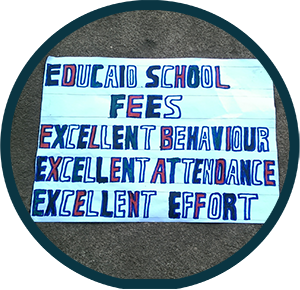 The EducAid fees are: Excellent Attendance, Excellent Effort, and Excellent Behaviour. Nobody can pay these fees other than the students themselves. Whilst it is our youngsters that achieve the results, it is our innovative child-centred learning system that empowers them. 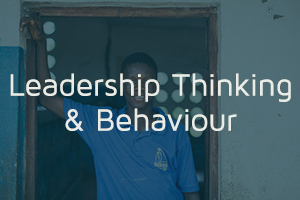 Traditional school teaching, particularly evident in Sierra Leone, is a system of rote learning. Chalk and board classes do very little to engage students, and often the teachers don’t understand the fundamental concepts that they are teaching. In most cases it is not a lack of will on the part of the teachers. More often the lack of quality teaching is borne out of poor training, and even a lack of quality education received. As an aside, this is the primary reason that we set up our QEP. What we have experienced in Sierra Leonean schools are teachers who do not fully know or understand the syllabus, and compensate for this by simply not teaching their students the subject units they do not know. We regularly hear reports of students sitting their exams and facing subjects that they have simply never come across. That is why, on the first day of the year, every student at EducAid is issued the national curriculum. It is from there that our students begin their studies. EducAid’s learning system is most akin to a tertiary-level learning environment. Our teaching staff will begin by focussing on literacy and numeracy: getting students to a good standard in these fundamentals. From they there will begin working through the syllabus by teaching the core topics to the group. Students are then provided access to the course materials; each student is allowed to work through the syllabus at their own pace, choosing their modules as they go. They attend classes as in a usual school, but will work through the learning materials independently, seeking help from teachers as and when required. Subjects are broken down in to units, and we expect students to take a minimum of 2 internal unit tests per week. Students move on to the next unit once they have passed with 70% or higher; should a student gain between 50% and 69% three times they are permitted to move on to the next unit and return to that unit at a later stage. 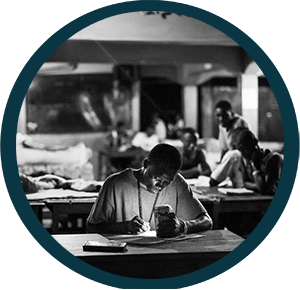 One of the ways that we break from the traditional Sierra Leonean model of teaching is that students are allowed to take their learning materials away with them from class. We do not want to monopolise studying time, and you’ll often find students in corners of the school studying away in to the evening. As part of our objective to pursue excellence we push all students to achieve their best. Our child-centred independent learning method is geared to allow students to progress through the course at different rates. Not only does our method accommodate different learning speeds, it also gives the student control over their own studies. Our learning method puts the responsibility on the student to actively drive their studies forward, and this democratic approach – one that empowers students rather than imposes upon students – is designed to give girls and boys an appetite for learning that is often absent in other schools. Our Quality Enhancement Programme, more commonly known as the QEP, is a nationwide teacher-training programme. We identified several years ago that the standard of teaching across Sierra Leone is woefully inadequate. Whilst we know that we have life-changing impact to our students in our schools, due of the difficulty of raising funds we are limited in the number of students that we can take in and care for. Of course, running 8 school sites across the country, a national teacher training programme, as well as our first stride in to tertiary education means that we have lots to say about our programmes as well. You can find out more about these by visiting our Programmes page.